American Honda Motor Co., Inc. today reported June 2015 Honda and Acura vehicle sales of 134,397 units, an increase of 4.2 percent. Acura sedans led AHM's June increase, gaining 107.9 percent on sales of 5,878. Acura truck sales also increased, rising 15.2 percent with sales of 9,649 vehicles for a new June record. Honda trucks gained 18 percent on sales of 57,667, also a record for June, while Honda car sales were down 11.3 percent with 61,203 units sold. Total Honda brand sales reached 118,870 for a gain of 1 percent. 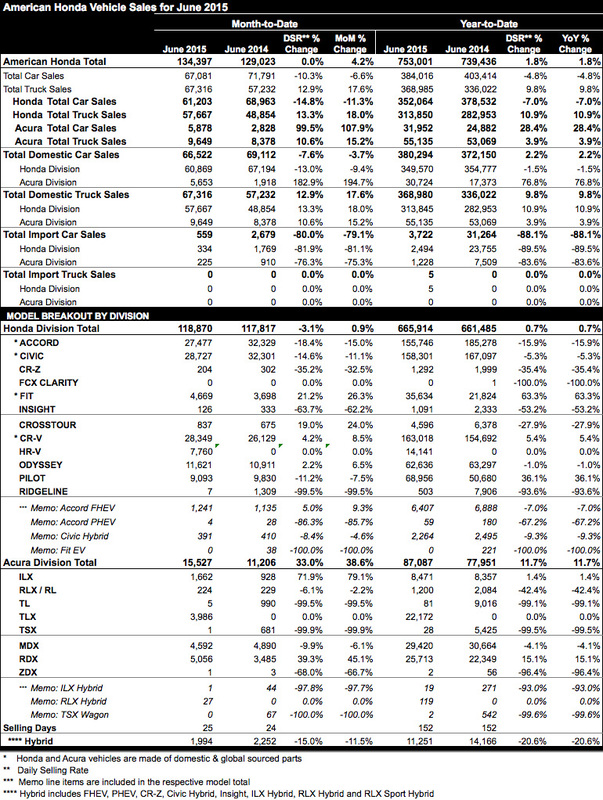 Honda trucks had a record month of June, gaining 18 percent. 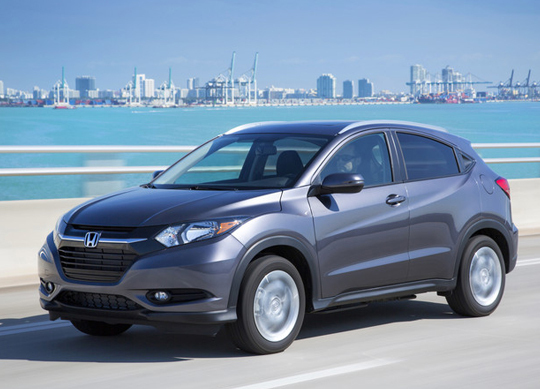 Honda's newest entry in the light truck market—the HR-V—continues to grab consumer attention, with sales topping 7,700 units in June, easily exceeding its stellar debut last month. The best-selling CR-V also enjoyed a record June and despite the strong consumer appetite for trucks, Honda's Accord and Civic continued strong sales while the Honda Fit scorched the sales charts yet again. Odyssey also gained ground in June. The best-selling CR-V posted record June sales, realizing a 8.5 percent increase on sales of 28,349 vehicles. Overall light truck sales remain on a record pace with Odyssey posting a 6.5 percent increase in June with sales of 11,621, supporting the record sales of CR-V and strong start for HR-V while the all-new 2016 Pilot enters the market. Sales of the versatile Fit jumped 26.3 percent, with 4,669 vehicles sold last month, part of the strong passenger car lineup that included combined sales of nearly 60,000 units for Civic and Accord. "With the introduction of the 2016 Pilot late last month, our SUV lineup is the strongest it has ever been, and it was already in very good shape," said Jeff Conrad, Honda Division senior vice president and general manager. "The next several months will be exciting as we begin to renew and expand our car lineup." Acura sedans stepped into the sales limelight in June, continuing recent momentum and doubling last year's June sedan sales total on the strength of TLX and ILX. Overall Acura sales totaled 15,527, lifting the brand 38.6 percent in June. Not to be outdone, Acura's RDX captured yet another sales record in June while MDX remained in high demand, though somewhat capacity constrained. Overall, Acura truck sales were up 15.2 percent with sales of 9,649 vehicles. "It is exciting to see Acura sedans enjoy success in the face of a market where light trucks have been dominating," said Mike Accavitti, Acura Division senior vice president and general manager. "We're pleased by the record month for the refreshed RDX, but the growing momentum of the TLX and ILX is key to the future of the Acura brand."